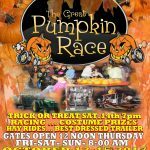 Here is the current Itinerary for this coming weekends Great Pumpkin Race! Some things may need added, but this will give you a good idea of what’s in store! In hopes of moving Friday along, Friday’s time trial will start at 3pm if we have over 250 entries on the grounds! We will have a last chance time run before eliminations begin. Gates open @ 8 am. No-Box, Box, Bike/Sled, and Juniors. There will be one (1) time trial starting @ 3pm. We will be giving $50 QCMP gift card to the first .000x light in eliminations. -We will have a bounce house up and running all day for the kids, as well as other fun games and activities to keep the kids having a good time! -FREE hay rides beginning @ 7pm till 9 pm. -There will be door/trivia prizes given out throughout the day! There will be one (1) time trial for single day entries ONLY starting @ 9 am. We will be giving away two (2) $100 Quaker City gift cards to best losing package(1st rd only)!! AND two (2) $25 Quaker City gift cards for best reaction time(1st rd only)!! -Racing for the cure charity Chinese auction put on by the Grubers. -We will have a bounce house up and running all day for the kids, as well as the FREE pumpkin for every kid! There will be a decorating station setup, as well as other games and activities to keep the kids busy and having FUN! -FREE hay rides 7pm till 10pm. -Trick or treating 7pm to 8 pm. -There will be door/trivia prizes given out throughout the day!! There will be one (1) time trial for single day entries ONLY starting @ 9 am. We will be giving $100 QCMP gift card for the first .000x light in eliminations. -We will have the bounce house up for the kiddos, as well as other fun things to do! -There will be a pit vehicle race. Must have at least 3 wheels and no knobby tires allowed. $10 entry and pro-rated payout. -If we get rained out before round one is over on Friday or Saturday we will carry the purse over to the next day. -Crosstalk will be on for the box class all weekend long. -Gold cards are not accepted for this event. -Fires must be in an elevated fire pit. We will have firewood for sale for $5 a bundle at the concession stand(limited supply). -This weekend is sure to be a busy one, so please help us by being in the lanes and prepared to run. -Electric $15/day; $25/3 day; $35/4 day. -If time permits we may POSSIBLY have a dial for dollars, but it’s not likely. -QCMP reserves the right to change anything as deemed necessary. 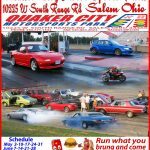 If you have any questions feel free to call or text 330-771-1534!